Are you a pre-university instrumentalist, 25 years old or younger, looking to improve your jazz skills? Are you looking to meet and play jazz with other musicians? Join us this summer for the 2018 McGill Summer Jazz Workshop! 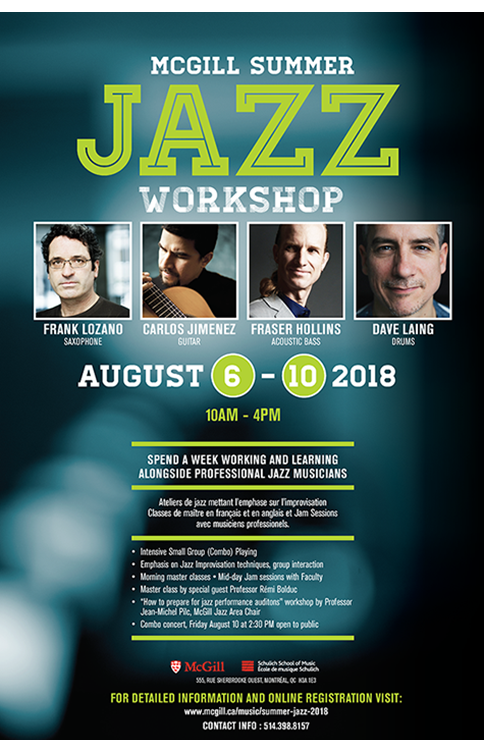 By signing up for the week- long jazz workshop, students can learn about and develop skills, playing experience and insight into the materials and methods essential to a program such as McGill’s .The focus will be on the Small Group Jazz Combo (4to 6 players per combo), the most direct vehicle for learning about improvisation, repertoire and most importantly, interaction among the participants. A ratio of 1 teacher to 6 students provides a stimulating and focused environment where students get personal one-on-one training from professional musicians. Morning master classes present essential basics about jazz materials, improvisation, jazz history, etc which serve to complement the combo sessions they have throughout the day. A daily teacher/student jam session gives the students a chance to gain real playing experience by applying their newly acquired skills, thus strengthening their confidence. As well, Associate Professor and Jazz Area Chair Jean-Michel Pilc will present a Performance Audition Requirements master class, where he will explain and de-mystify the audition process , providing helpful and detailed advice to prospective undergraduate applicants. New this year, Prof. Rémi Bolduc will be our special guest clinician; students will benefit from his extensive experience as a virtuoso improvisor and teacher. Special Masterclass by Prof. Jean-Michel Pilc: "How to prepare for jazz performance auditions"
To apply, fill out the online form. We will get back to you as soon as possible. If your application is accepted, you must pay the full camp fee ($425) by June 4, 2018. If you cancel after July 22, 2018 you will receive a 50% refund. Who can attend this camp? Typically, a pre-university student 25 years old or younger, secondary 5 or CEGEP or equivalent, who is currently involved in playing jazz in ensembles like big bands, jazz combos, or the equivalent. What musical level are participants expected to be at? Musicians attending the camp should be familiar and have some experience with the basics of jazz improvisation such as soloing using the chord symbols on a lead sheet, functional playing on your instrument (melody for horns, comping for guitar and piano, walking bass line for bass, keeping time with the ride cymbal for the drums, etc. ), and of course, some knowledge of the jazz tradition (American Songbook Standards). You should have some experience playing on Bb blues, and tunes like Autumn Leaves, All the Things You Are, Blue Bossa, etc. This is not a camp for complete beginners. Which instruments are accepted to the camp? Rhythm section instruments such as piano, guitar, bass (acoustic or electric), drum kit, as well as saxophones, trumpet, trombone, flute, and clarinet are accepted. We are not, at this time, accepting vocalists in the combos, however, we are examining the possibility of running a separate camp, at a later date, that will focus on the tradition of vocal-led combos. Applications are reviewed and accepted on first-come-first-served basis according to the considerations listed above (age, instrumentation, musical proficiency). Places are limited, so we can only accept 8 winds, 4 pianists, 4 bassists, 4 guitarists, and 4 drummers. After these spots have been filled, applicants are placed on a waiting list in the order their applications were received. All applicants will receive an email notifying them of their status. If you have been accepted, your spot will only be confirmed once you have made a payment. Failure to do so in the time frame stated may result in the forfeit of your spot, in which case it would then be given to the 1st person on our waiting list. What is the goal of the camp? To broaden and expand the students’ knowledge and playing experience via the small group jazz combo (4 to 6 players per combo), the most direct vehicle for learning about improvisation, repertoire and – most importantly – interaction among the participants. As well, Associate Professor and Jazz Area Chair Jean-Michel Pilc will present a Performance Audition Requirements master class, where he will explain and de-mystify the audition process, providing helpful and detailed advice to prospective undergraduate applicants. 10:00 am - 11:00 am: Masterclass on jazz materials, improvisation, or ear training/listening, etc. On the last day, Friday August 10, a small informal concert will be held at the Schulich School of Music (location to be determined) where the students can share the music they have been working on with their families and friends. Can I use the practice rooms at McGill University? Yes. Four combo rooms and several practice rooms are available to you during building hours from 7:00 am-10:30 pm. Those interested should bring a $30.00 cash deposit for a magnetic swipe key; all deposits will be refunded on Friday upon remittance of key. How much does the camp cost? How and where can I pay? The workshop has a tuition fee of $425, which is paid in one instalment by cheque. Please write the name of the participant on the cheque. All applicants will receive an email telling them whether they have been accepted or not. If you have been accepted, your spot will only be confirmed once you have made the full payment by cheque. If you have been accepted, your spot will only be confirmed once you have made a payment. The deadline for fee payments is June 4, 2018, two months before the workshop start date which is August 6, 2018.